Please take a moment to grab a coffee or a glass of wine and sit back while I tell you all a little story about race(ism). And how it has impacted my life. Back when my sister and I were in college in Normal, IL, I was fumbling and bumbling toward a degree in partying. Cindy moved back up from Tallahassee, FL where she spent her first two years of college pursuing her degree in Nutrition, to finish it in Illinois. I don’t know why–if she was just homesick or missed me or I missed her so much she couldn’t stand it– but she did move back and in with me. We lived in this really weird house, where we shared a bedroom for the last year that she finished her degree. I finished my bumbling and decided to drop out for a year while deciding what I wanted to do (and stop wasting my parents’ money in college, while I was feeling so unsettled and directionless). I’ll just say it. We smoked a lot of pot back then. It was the late 70’s and that was our thing. We had a small house, shared with two other gals, with no TV but a stereo, and we spent our time doing bongs, and listening to Joan Armatrading, Todd Rundgren, Peter Frampton and Gino Vanelli. You get the picture. While maintaining my solid C average my last semester there, tripping over my intellect, I worked as a waitress at a swanky country club. It was there that I learned to drink Scotch, which I now despise. I also learned how to serve, while being treated like crap by wealthy people. To be honest, I was probably a pretty terrible waitress. But I did my time. Cindy, while finishing her degree, worked in the kitchen at the International dorm. She served food there, so was popular as she gave two scoops of macaroni and cheese to her favorite diners. Her outgoing, bubbly personality gave way to many invitations to the International parties. We met students from all over the world that year. While living in our small, smoky house, and trying to nurse what I’m sure was a low-grade depression, I decided to lift my spirits, by having this friend of a friend, former hair stylist now student, give me some “highlights” in my drab, dishwater blond hair. She sat me on a cold metal chair, in our small linoleumed floor kitchen, while painting this terrible green goop all over my head. She said this “henna treatment” would perk up my blond hair and give me highlights. I needed anything to perk me up, so readily paid her $20 fee for this service. I was so excited for my new look! Right up to the moment where she was rinsing the goop out, in the mirrorless kitchen sink, and said in a flat tone “wow, you have a lot of red in your hair”. I felt my heart begin to race, as I had never had one shred of red in my hair that I knew of. She trimmed and dried my hair, and I quickly scooted to our one poorly lit, clawfoot tubbed bathroom, to be met with….well…Howdy Doody staring back at me from that old medicine cabinet mirror. Yep, my hair was bright orange. Not a cute, natural red even, but some kind of brassy, bright orange, like you would see on a clown wig. I was horrified. The stylist knew this was bad. She offered to run to the hair supply store to get this formula that would take this hideous wig off. Which it most certainly did not. Nothing would take Henna off, it turned out. I was stuck with it. I went from this kind of granola, hippie chick style who rarely wore makeup and mostly bell bottom jeans, and cotton Indian shirts who wanted a little, not obvious, perk-up. To someone who clearly was out of their damn mind. I had to go to work the next day like that. And after the bug-eyed responses, people laughed. Of course, they did, I looked like a straight-haired clown. I can’t blame them, really. It was all so disorienting. But it truly was not fun for me, at all. I didn’t want to leave the house. The low-grade depression elevated to a medium grade. Not even a bong hit made me feel better. Elton John couldn’t even cheer me up. It was terrible. That signature is the very one I took to the tattoo parlor to have her name tattooed on to my back. Things started getting a lot better in my life after I did that too. I met my husband that year. Now that I’ve digressed, on top of my digressions, you can see why I asked you to pony up to your laptop with a relaxing beverage, because this post is about race, and I’m about to tell you why. Please feel free to take a break and refill your glass or cup, in my case. One of the friends Cindy made that year in the International dorm was a man named Rufus O. Rufus was a very tall, very dark, very handsome man from Nigeria. When I say dark, I mean Rufus’ skin tone was as black as I’ve ever seen. If we were at one of the many house parties I attended with him, he was often spinning records quietly off to the side, and you could find him because of his intense white smile. He had the whitest teeth and the biggest smile, made all the brighter from the contrast. Rufus was a graduate student at that point. I think he was studying chemistry. He was a quiet man with a loud, deep voice. When he spoke, you listened. His voice often reminded me of that Uncola man on the commercials. He was smart and motivated and kind of a straight arrow for us, as we were basically the party girls. I don’t know how long it took for them, or how long before she admitted it to me, but Cindy fell madly in love with Rufus. She kept it quiet for awhile, you know, the interracial thing. When it came time to move forward after she graduated and I dropped out, she and Rufus decided to pursue further education at Western Illinois University. She, a Master’s in Community Health Education and Rufus, a PhD in Chemistry; maybe Biology. Rufus had his eye on medical school, which he did ultimately pursue, and complete. Cindy also completed her Master’s curriculum during the two years she spent with Rufus there. They were both excellent students. Our brother John, followed Cindy to MacComb, after graduating high school and completed his Bachelor’s degree in Marketing at Western. I wonder if Cindy hadn’t been there, if he would have been able to make that milestone. John spent all of his free time with Cindy and Rufus, who named him “Big M” and “Vacumn Cleaner”. Rufus would say both of those names for John, while laughing his deep hearty laugh. “Big M” referred to “Big Miser” as John was always mooching off of them and “Vacumn Cleaner” referred to his ability to eat mass quantities of their food. Rufus was an amazing cook and taught us all how to make this Nigerian chicken dish and Jellof rice. Rufus and Cindy often hosted dance parties. Prince was one of Rufus’ favorites as he spun that original Prince record, “I Wanna Be Your Lover” our favorite, as Cindy and I spun our disco moves in their dark living room. He gifted us these long, tie dyed, African gowns that we wore, as we pulled off our best Travolta-style moves. Their apartment was filled with serious studies, and serious fun. It was full of love and laughter. 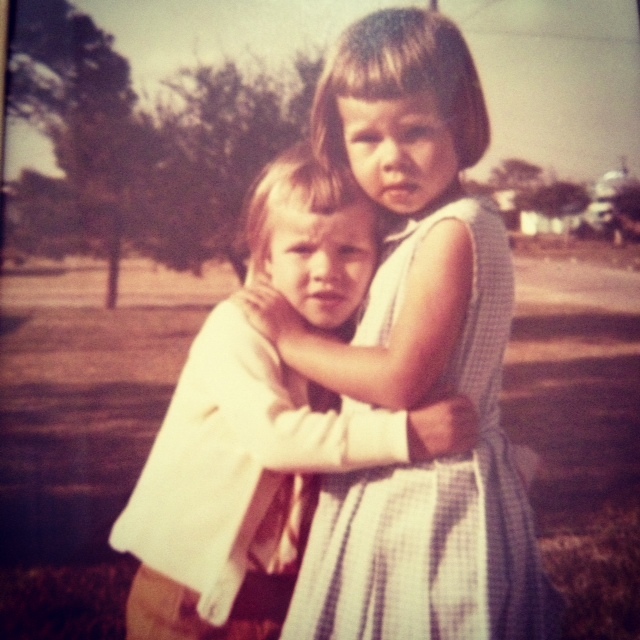 I don’t know when it started, but Cindy started to feel the sting of racism there–some from within our own family. Maybe most of it, actually. Marj, our stepmother, raised in Mississippi, was liberal politically but still a victim of her roots. She wrote Cindy letters– intellectually judgmental letters–telling her things like “I just think it’s selfish for you to not consider what any future children you might have with Rufus might suffer in this world”. She didn’t appeal to the world’s judgment but marked Cindy with words like “self-centered” and “as usual, all about yourself”. Classic Marj. Once, my Dad, Marj and Marj’s parents went to MacComb to visit Cindy. Marj’s parents, our legal “grandparents” who we had known for over a decade at that time, refused to get out of the car, much less step foot in Cindy and Rufus’ apartment. They refused to even meet Rufus. Their boycott spoke volumes, and Cindy felt it. During their tenure at Western, I got my act together, went cold turkey off pot, and moved to Arizona to pursue my nursing career. I got straight A’s the first year I re-enrolled in college. I changed my entire style of dress and back-to-blonde hair to a more conservative look. I made new friends and settled in well as a full-time student with a part-time job at a nursing home. that I’d set up before I even moved out. Arizona was a good fit for me. Cindy came to visit me within that first year, and was restless. She spoke openly for the first time about how the stress of being in this interracial relationship was affecting her. She showed me letters from Marj, and shared about the Mississippi boycott. All of this was terribly painful for her. Their racism did hurt her, and it did affect her choices. Cindy ultimately decided to leave Rufus. It was during that decision, that she confessed to me that she had been married to him for two years. Rufus, being more conservative, didn’t want to live together without being married, she explained. So she agreed and slipped away to a courthouse, and married him in secret. I was astonished she had kept this from me. I guess this is the kind of pressure she felt. This was in 1981, not 1951, but she felt it just the same. Throughout the years, Cindy would reflect on Rufus and how good he was to her. How he helped her achieve goals, how they almost never fought, how kind he was even after she decided to leave him. At times she was wistful, wondering if they ever might find each other again. They did keep in touch, periodically. Cindy, then followed me again, this time to Arizona, where she put the final touches on her Master’s degree–an internship at ASU. Shortly after graduating, she broke my heart in a million pieces, when she decided to take an incredibly prestigious, corporate job in Minneapolis and moved there. She headed up one of the first corporate wellness programs in the country, at Control Data, and bought a condo. She was financially successful but became personally miserable after three years. Again, she moved back to Arizona, in with me for awhile, and ultimately got her own apartment in Mesa. It was from that apartment that all the walls came tumbling down. Cindy was still trying to get on her feet when she met Michael Apelt. She took easy jobs, having broken away from the corporate pressure of Control Data. She needed a break, she said. She worked as a waitress at a pizza restaurant, and as a weight loss counselor at a couple of well known companies. “Nutri-Hell” she liked to call one of them. She wasn’t happy, all of her friends were getting married, and having babies, and she was headed to her 30th birthday feeling pretty adrift and unaccomplished. Along came tall, blond, blue-eyed Michael Apelt. Sociopathic radar zeroed in on the most vulnerable women in the disco. There were many, but Cindy was the most vulnerable. And the most hopeful. perhaps. Among her many entries about Michael in her diary, one stood out to me most bittersweet, “He is my white Rufus”, she wrote. This caucasian, Aryan even, German, blond, blue-eyed man who’d swept her off her feet, within weeks, abetted by his brother, murdered Cindy just as they’d planned from the start, for life insurance– days after she’d received a postcard from coal-black Rufus sent from, of all places, Germany. Her former husband wrote about how he was coming to the States, and would like to visit her sometime over the Holidays. Of the many if-onlys, I wonder what might have happened if he’d arrived even a few days before that terrible, terrible night; Dec. 23rd, 1988. Rufus’ postcard ended up as a piece of evidence in a courtroom, the following year. Rufus, initially, became the prime suspect in her murder, helped right along by Michael Apelt, who tried to divert suspicion from himself and his co-murdering brother. He did the same with me, incidentally. The Apelts were ultimately arrested after their second attempt to throw suspicion in the African American direction, claiming “two black men came to the door and threatened us”. They clearly didn’t know that undercover officers were watching Cindy’s apartment, where the murderers had holed up 24/7, when they weren’t executing their cover-up or hawking her jewelry. The detectives saw no men fitting that racist description anywhere on the property, much less at their doorstep. The Apelts were arrested right after that final slip in their plan. I was questioned at length about Rufus. Rufus was tracked down and his passport investigated. He was interrogated over the phone. I think Homeland Security was involved at one point. Rufus went from dreaming about revisiting the love of his life, to finding out she’d been murdered, and harshly interrogated about it. Merry Christmas Rufus. Rufus tracked me down eventually; devastated and confused, obviously. He talked, also, about still loving Cindy and having wished they could reconcile. If only he had found her again, a few months earlier. Over the years, especially diving in to these events for my book, I’ve wondered what now-deceased Marj, and her parents might say, as we naturally compare the relationships of Nigerian Rufus with his MD, and night-black complexion, to the lily-white con men who stabbed Cindy to death in the desert, on the night before Christmas Eve. Was your relief that she left Rufus something you celebrate now? Was your abject dismissal of the value of him as a human being or them as a couple, something you feel proud of? Is the fact that your judgment of Cindy’s relationship, became part of the recipe that pushed her out of the only safe arms she had ever known with a man, into a knife to her throat by someone you would have approved of, something you feel good about? Did you learn one damn thing through all of this? Rufus went on to practice medicine internationally. The Apelt brothers went to Death Row. One of them got married from prison. I don’t know if Rufus ever remarried. Kathy, Your stories always bring out such strong emotions in me. Some make me laugh and feel such joy and happiness. Some, like this one, bring out both anger and sadness. Tears ran down my cheeks as I read this chapter and felt so sad for you, Cindy, Rufus and your dad and brother. Even sadness and anger, for and about Marj because she just didn’t get what racism is really about nor how strong love really can be. Thank you, Kathy, for another very interesting and moving story about you life! All I can say is wow. Maybe I’ll have more words another time, but for now, that’s all I have. So much I could say, but I do not have your skill to put into words … or it would take me many chapters to do it decently. We have many similarities in our lives, Kathy. When you write, I feel I am living your experiences. I feel the pains, the sadness, the angers. I feel the tensions, and I also feel you letting go of the negatives. I think your John David has released another side of you, or at least helped to make your path through the madness of the world’s worst situations much more tolerable and able to look it in the eye with an “you will not destroy me” attitude that is powerful. That eminates out from you and envelops me/others in an unexplanable way. You are powerful, and I adore you. I so wish you did not have so much distress throughout your life, but without it you would not be the “You” that you became. My best to Rufus, wherever you are. Sad that Cindy was not able to overcome the snide cruel ways of some. Words can have profound effects on others … this is a perfect example.